Today the Orthodox Church celebrates the Third Finding of the Head of St. John the Baptist (the first two findings are celebrated on February 24). The relic had been in Emesa (in modern day Syria), but was moved to Komana (in modern day Turkey) during Saracen raids in the early 9th century. It was subsequently hidden and buried during the second wave of iconoclasm. When the icons were restored to the Churches, Patriarch Ignatius of Constantinople (A.D. 847-857) received a vision which told him where the head of St. John was hidden. He communicated this to the Emperor, who sent an expedition to bring the relic to Constantinople. The head was found today in A.D. 850. One meme that keeps popping up in this corner of the internet is the complaint that the ubiquitous Sword +1 is boring and that magic items should inspire more awe and wonder. I myself have played with systems to try to alleviate this particular issue by imagining the process by which a sword is made. The story of St. John’s Head, however, suggests that giving even a boring old Sword +1 a simple history can transform it from a mere mechanic into a real magical treasure. *On a 1-2 the sword was buried with the owner on a 3-6 it was taken by those who killed the owner, or the sword's fate can be determined by fiat. How did the next owner receive the sword? Once each owner is determined, all one has to to do is decide what order they owned the sword and fill in any details that are desired. 6-4-3 King had it stolen and was found in a dungeon. Looking at this, I can fill out the details: A king had the magical sword forged, but before he was able to wield it in battle, the sword was smuggled away into a dungeon. A descendent of the king (2nd son?) went searching for the weapon and found it in the dungeon; however, he was killed on the journey home. A knight seeking fame and glory hunted down a beast in the wilderness, in the lair he discovered the sword. He went on to become famous, but died in a battle defending the realm. His sword was buried with him. Obviously, further details can be added (such as the names of each owner and what lands they ruled and defended). Should this Sword +1 be found in a treasure hoard other than a tomb, one need only add one more layer to the story: monsters looted the tomb and, depending upon which monsters guard the hoard, either don’t know its value, don’t use swords or use it to defend the rest of the treasure. Regardless, this lowly Sword +1 is no longer boring. It has a story. It was forged for a king. Men died trying to get it back. It took part in a great battle to try and save the realm. It is an item worthy of wonder, despite the fact in it is “only” a Sword +1. I got to see Ironman 3 last night and given Tony Stark’s use of all the various versions of the Ironman suits with a kind of remote control as well as the trailer for the new Superman movie (which preceded this latest Ironman movie) got me thinking about golems. Anyone who has played D&D is familiar with the concept of the golem — a figure made out of various materials and brought to life as an automaton. One of the original source materials for the concept is Jewish in origin. There are a variety of stories that involve man trying to duplicate God’s creation of humanity. An anthropomorphic earthen vessel is created and given life; however, the end-result is always imperfect and often dangerous. Thus, the core of the legend is a cautionary tale about hubris. The most famous golem-tale is that of the Golem of Prague. The 16th century rabbi Judah Loew ben Bezalel is supposed to have built a golem out of clay from the banks of the Vltava river in order to protect the Jews of the Prague ghetto from the pogroms of Rudolf II. In the classic tale, the golem was eventually destroyed by the rabbi when he forgot to let it rest on the Sabbath; however, there are versions where it becomes a monster that goes on a murderous rampage. However, something interesting happened with the golem Superman — despite his superior abilities and alien physiology and origin, he deeply identified with humanity. His upbringing as Clark Kent formed the foundation upon which he became a hero rather than a monster. Indeed, I have often argued that the superhero of the Superman stories isn’t the Superman persona, but, rather, Clark Kent — precisely because he strives so hard to be a human being. 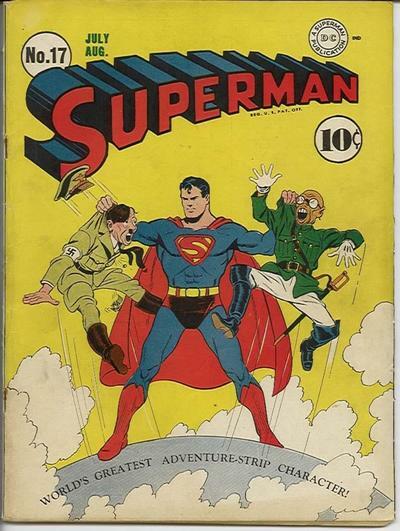 I also believe that it is one of the keys to his long-term success as a literary character and one of the reasons that, despite my preference for normal human comic book characters like Batman and Green Arrow, Superman is one of my favorite superheroes. I can’t help but respect him, not because he is so irritatingly powerful, but because he tries so hard to be human despite all that power. In a way, all superheroes are golems and the best ones are those who struggle with their own humanity (or, as Superman, to be human). One of the reasons that I collected DC rather than Marvel at the height of the popularity of the X-Men and Wolverine during the 1980s & 90s was due to the glorified golem qualities of Marvel’s Mutant Universe. As is often acknowledged, the mutant story lines serve as a commentary on whatever shade of bigotry one wants to explore; however, other than the Us vs. Them bigotry, the concept of Homo sapiens superior is rarely, if ever, compared to what it means to be human. As a result, the debate is often stuck at: Should we make war against humanity or Should we be magnanimous and protect humanity? It always bothered me that both cases infer the inherent inferiority of humanity. The question of what it meant to be human never became a foundational principle like it did for the Superman character. Therefore, all of Marvel’s mutants all end up being merely golems. As with the original stories about golems, the concept is most powerful when it is an expression of hubris and its destructive consequences. Ironically, there are a plethora of monsters in D&D that are better at being golems than golems on this score. My two favorites are orcs (especially if understood in Tolkienesque terms as the result of twisted experiments on elves) and owlbears (which are described as the result of a twisted experiment by a magic-user). I find myself in an interesting situation with the ACKS custom class system. I am struggling to find a way to differentiate the Blue Mage (see the comments) from what I came up with for the White Mage in ACKS; however, ACKS gives me I the means to actually bring to life some flavor text about the Green Monks that I posted almost two years ago — something that I have never really been able to flesh out otherwise. Green Monks are an eremitic monastic order who primarily live in the wilderness as hermits. They are known for their green robes, which are dyed with the same plants that they use to make green elixirs, for which they are well known. They shave their heads and take various vows of silence. Green Swords are the military arm of the order. These soldiers are famous for their unarmed fighting techniques. A player must choose at character creation whether or not their character is a Green Monk or a Green Sword. This choice cannot be changed. Both classes fight and save as Fighters, can wear Leather armor or lighter and use any swords, daggers, spears, pole arms and all missile weapons. They can fight with either weapon and shield or two-handed fighting styles. Both build Sanctums using the Castle rules for a stronghold at 9th level. Attunement to Nature: Since they spend most of their life living alone in the wilderness, Green Monks and Green Swords have a +1 to surprise rolls when in the wilderness. Nose for Potions: Both Green Monks and Green Swords can make a proficiency throw of 11+ to determine the magical properties of potions or oils. At 5th level, they master the skill of brewing potions (all with their trade-mark green hue) as if a mage of their class level. Combat Awareness: Both Green Monks and Green Swords gain a +1 bonus to AC if wearing leather armor or less and able to move freely. This bonus increases to +2 at 7th level and +3 at 13th. This power stacks with Swashbuckling. [This is the same as the Blade Dancing custom power]. Lay on Hands: At 2nd level, the Green Monk can restore 2 hit points per experience level once per day by laying on hands. Proficiency slots can be used to gain additional uses of this power per day. Longevity: At 12th level, the Green Monk learns to completely rely upon God for sustenance. They have a lifespan 3 times longer than normal and become immune to ghoul paralysis. Unarmed Fighting Routine: Green Swords are trained to fight unarmed. In melee combat they may attack with this routine, attacking three times for 1d3-1/1d3-1/1d6-1 damage. [This is the same as the Fangs and Claws custom power]. Brown Mages are arcane spell casters who study the way in which the patterns of nature parallel those in the arcane. Some see this as God speaking through nature, others simply see it as an intellectual curiosity. Many are allowed operate outside the Mage Guild because their studies normally are benign. In addition, this path of study tends to garner less arcane power than that of the normal (Grey) Mage. Brown Mages gain and cast spells like normal Mages, however, at 2/3 of their character level (with anything .5 or higher rounded up). Thus, they don’t get to do Magic Research (minor) until 7th level and major Magical Research until 13th level. In addition, they only have one fighting style — two weapons. Speak with Animals At 3rd level the Brown Mage may Speak with Animals as per the spell at will. Friend of Birds and Beasts At 4th level a Brown Mage has become well-versed in the natural world and can identify plants and fauna with a proficiency throw of 11+. In addition, the Brown Mage understands the subtle body language and moods of birds and beasts and therefore gains +2 to all reaction rolls when encountering normal animals, and can take animals as henchmen. Muster Animal Help At 5th level, a Brown Mage can use the Summon Animal spell as a spell-like ability once per day. Rally Fantastic Beast At 8th level, a Brown Mage can use the Summon Fantastic Beast spell as a spell-like ability once per day. Summon Elemental 11th level, a Brown Mage can use the Conjure Elemental spell as a spell-like ability once per day. Brown Mages fight and save as Mages and build a Conservatory using the Hideout rules at 9th level. Today is the feast of St. David the Martyr of Georgia, who was born to a noble Christian family. His father died when he was still young and his uncle, a pagan, seized all of the family’s possessions. The true heir, however, was St. David. Fearing this claim, the uncle first tried to win over his sister Tagine, David’s mother. This proved to be futile. Therefore, he tried to convince David and his brother Tarichan that he was now their father and that his was a better way than Christianity. Both refused, boldly declaring that were willing to endure anything for their Lord and their true Father in Heaven. St. David’s uncle feared reprisals from the Christians, therefore he did not immediately kill his nephews. Rather, he plotted their murder in secret. Tagine, sensing danger, smuggled herself and her sons to lands in the south. There, they lived in hiding as shepherds for many years. Spies, however, eventually discovered their whereabouts and St. David’s uncle ambushed them in the mountains. Rather than defend himself, St. David ran to his uncle to embrace him in love. His uncle ran him through with a sword and was immediately struck blind. The staff held by St. David was transformed into a tree. Soldiers also chased down and killed St. David’s brother. When their mother discovered that her sons were murdered, she at first was filled with sorrow and denounced her brother; however, he repented. Taking soil soaked in St. David’s blood, she covered her brother’s eyes and his sight returned. He went on to repent before the bishop, got baptized and built a church in honor of his nephew. The period where the story of David’s martyrdom and church built in his honor are freshly known. I realize I mention it a lot, but this story marries very well with T1:The Village of Hommlet and would make one of my favorite modules even better. In the first case, Lareth the Beautiful could be the leader of a cell of spies in search of the nephews of a noble of the Old Faith. Rather than leading the characters to the Temple of Elemental Evil, it could lead characters into the political intrigue between the followers of St. Cuthbert’s God (Christ) and those who still hold to the Old Faith (paganism). In the second, one could replace the Church of St. Cuthbert with the church built by the uncle in honor of the nephew he martyred. Thus, both the local Christian Church and the Old Faith would have a very rich local history. In addition, the tree that miraculously appeared could be a place of both pilgrimage and a place of safety for PCs on wilderness adventures (no wandering monster checks and double the hit points regained with rest). The next classes I will tackle for my conversion of Averoigne to ACKS are some of the alternate magic-users suggested by Tolkien’s rainbow of wizards (white, grey, brown and blue). You can see my original post on the subject here. I will begin with the color white. This is the first major conceptual bump on my journey to converting Averoigne to ACKS. It is possible to interpret Holmes so that only magic-users can use cleric scrolls. This, in turn, suggests that the cleric spells can be both divine and arcane. I took full advantage of this with my Tolkien homage. ACKS, however, makes a much clearer distinction between the two types of magic. Indeed, should a custom class wish to cast magic from the other spell list, the proficiency that accomplishes this (4 spells at a time) is called Apostasy and the custom power is called Forbidden Spells. If I were to follow this internal logic, it is possible to create a mage class that can expand their spell list by 12-16 spells, but can cast fewer spells than a normal mage and gains the ability to do magical research later than a normal mage. Personally, I don’t think the trade-off is worth it. Alternatively, I can provide a number of interesting powers, including 4-8 spells from the cleric spell list. Among these is the ability to Turn undead as a cleric half the current level of the character. Again, however, this class would cast fewer spells than a normal mage and wouldn’t get to do magical research until higher levels. I am much more intrigued by this possibility than the first; however, I still don’t know if it is worth it. Finally, it is possible to have the mage be able to Turn undead (which could be traded in for 1 or 2 custom powers) and cast cleric spells at half the character’s current level. This would allow not only for a wider spell selection, but the ability to cast more spells and do magical research in the same way a normal mage would. From a mechanical point of view, this last option is the most optimal and the one that most closely emulates my original Holmesian class. From a conceptual point of view, however, the water is rather muddy. The divine spells are actually divine in nature, not arcane. The spell lists and spell progressions are two different entities. This does not accomplish what I set out to do. White Mages are men and women of faith who wish to use arcane magics in concert with their faith and the Church, sometimes even within the Church structure. Like normal mages (aka Grey Mages), White Mages begin the game with a repertoire of arcane spells modified by their INT; however, once they have proven themselves faithful to both the Church and the Mage’s Guild, the White Mage gains access to a second repertoire of spells. What follows is a list of numbers representing the numbers of spells a White Mage can prepare each day per level. The numbers outside of brackets represent the amount of normal arcane spells that can be prepared. Numbers inside brackets represent the amount of divine-like arcane spells that can be prepared. The numbers are read left to right in terms of spell level with the furthest left being first level. Aura of Protection: Due to their chosen path of faith coupled with the arcane, beginning at 2nd level, White Mages have a +1 bonus to AC and saving throws against chaotic (evil) creatures and effects. This appears as a golden aura when viewed with Detect Good, Detect Magic or Trueseeing. White Mages fight and save as Mages and use the Sanctum rules to build a Stronghold at 9th level. The next class to tackle in my conversion process to ACKS for my Averoigne campaign is my Holmesian Paladin. This class really came about as an opportunity to offer an HTH-only fighter type in the way the Holmesian Ranger is missile/thrown-only. I also took advantage of the DEX-based initiative system of Holmes by allowing the Holmesian Paladin to trade places with people on the initiative order. Since initiative is dynamic in ACKS and a mere +1 to an individual’s initiative is considered a custom power, I am not going to try and go the initiative route. Rather, I am going to play up the original meaning of paladin which refers to a trusted military leader or imperial officer. Although the Salians are recent interlopers in Averoigne, theirs is a Kingdom that has lasted nearly a thousand years. Thus, the noble families of the Salians are both well-established and steeped in tradition. There is also a need for those who are not first born to go out on their own and make a name for themselves, since they are not to inherent the family title or lands. Salian Scions represent these title-less noble born who seek to carve out lands of their own. If the weapon uses the two weapon fighting style than no two handed fighting style. If the weapon uses the two handed fighting style than no weapon and shield fighting style. If the weapon uses the weapon and shield fighting style than no two weapon fighting style. Blood of Kings: Due to their noble lineage, Salian Scions are allowed to take one more henchmen than their CHA allows and all henchmen have their morale raised by 1. Family Military Tradition: Salian families are closely associated with certain weapons. For example, those who are descended from the Merovingians are known for their prowess with the Two-Handed Sword. A Salian Scion is trained starting at birth using this family weapon. Therefore, the player may select one weapon as a family weapon at character creation which cannot be changed later. The Salian Scion receives a +1 to attack rolls with this weapon. In addition, readying or sheathing this weapon counts as a free action. Inspire Courage: At 2nd level, Salian Scions have perfected the art of improving morale of troops. Prior to battle, the Salian Scion may spend one round encouraging those around the character (50’ r.) and these allies gain a +1 to attack throws, damage rolls, morale rolls and saving throws against fear. This bonus lasts 1 turn. This can be done to any given character once per day per class level. This does not work on characters already engaged in combat. Command of Voice: At 4th level, Salian Scions have earned enough of a reputation that their very words hold power. They receive a +2 bonus to reaction rolls to creatures spoken to. If the result is 12 or more, the subject acts as if charmed. Creatures with a higher WIS than the character’s CHA are immune. Salian Scions fight and save as fighters, have the same proficiencies as fighters and use the Castle rules to build a Stronghold at 9th level. I would just like to take a moment to thank both Tavis and Andrew for dropping by and commenting on some of my meditations on ACKS, especially Andrew’s suggestions for improving my Burglar Class. This is what I love about this little corner of the internet and what I love about the philosophy about many of the publishers who target the OSR community — they actively support and encourage folks to actually use their products in ways that the end-user wants to. To that end, I should mention that Dan of Goblinoid Games has also dropped by and endorsed my use of S&S 2e to fiddle with the LL Thief, which is really cool. I’d also like to mention that having fiddled now with the Custom Classes section of the ACKS Players Companion, that this is probably one of the best things that has come out of the OSR. As I have mentioned before, ACKS is a great system if you want a character build opportunity with your B/X. Not being one of those guys, ACKS would not be my personal first choice of rulesets. That being said, however, the Custom Class section is easily portable to B/X or LL and allows players to add all kinds of flavor-filled classes to their campaign worlds to make them come alive. It also scratches that character build itch quite excellently. Therefore, I highly recommend getting yourself a copy, even if ACKS doesn’t seem to be your cup of tea. Today the Orthodox Church commemorates the consecration of the city of Constantinople, which gives me a chance to do things a little differently this Saturday. Normally, I would go through the story of a saint’s life and pull something interesting or inspiring to apply to RPGs. This (hopefully) demonstrates how useful it is to plum the history of Christianity and how truly rich that history is. Today, I am going start with an RPG concept and see how the story of Constantinople fits that concept. When designing an RPG environment, especially those that PCs are going to explore — the dungeon, the wilderness or a urban area — it is useful to have multiple layers of history to that area. These multiple layers give the DM/GM/Ref/Judge/LL/etc. a rich tapestry from which to improvise information about a specific area. Skulls of various humanoids for orcs. Leaf designs and the image of a great tree (protected by a dragon?) on the stone work (possibly de-faced by orcs) for the elves. A strange pattern of circles in bas relief in the floor for the dragons. Knowing these two larger details (the elven temple and dragon nursery) lead to a far more interesting and cohesive set of smaller details, which can then spin off into adventure hooks or interesting NPCs interactions (say an elf or a dragon looking for evidence that these places still exist). Byzantium was a Greek colony founded in 657 B.C. and named after a king of great renown by the name of Byzas. St. Andrew the Apostle preached in Byzantium in the first century A.D., setting up a Christian community and ordaining St. Stachys of the Seventy as bishop. The city sided with Pescennius Niger, an usurper to the Roman thrown. The city was besieged by roman forces and heavily damaged in A.D. 196. 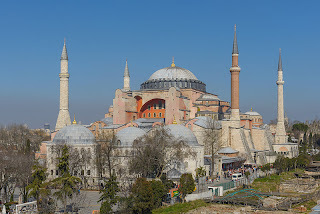 St. Constantine, the first Christian emperor, chose to make the city the new capital of the Christian Roman Empire, renaming it Constantinople. It was consecrated today in A.D. 330. Despite many attempts, the city stood firm and ruled over the Roman Empire for 1000 years. It was finally conquered by the Ottomans in A.D. 1453. The city was renamed Istanbul (which is really a mutation of a Greek phrase meaning to the City). 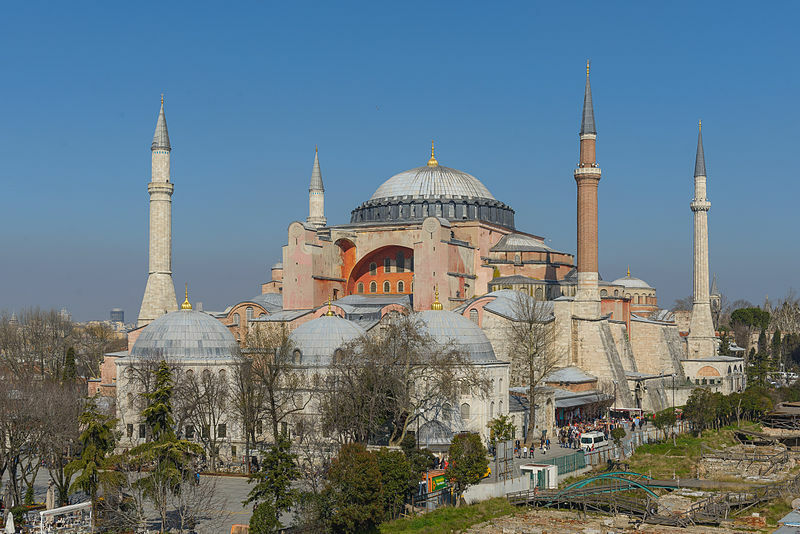 Churches were subsequently taken over and turned into mosques or torn down (Hagia Sophia, for example — shown above in an image from Wikimedia Commons). The term Byzantine Empire was coined by a Frenchmen in the 16th century. Today, the Patriarch of Constantinople still has the title Ecumenical Patriarch due to its historic association with the capital of the Roman Empire and he traces his Apostolic Succession to St. Andrew. Thus, in a Mutant Future campaign where modern Istanbul lays in ruins and is crawling with irradiated monsters, there is a rich tapestry of historical clues one can give PCs along with a great hook for adventures: the remnant Christian church is hoping to find relics from when the city was still occupied by humans. Averoigne has large swaths of land that are wilderness creeping into the lands of civilization. Therefore, there is a long warrior tradition within Averni culture that learns the ways of the wilderness in order to protect civilization from the wilderness. Averni Rangers may wear chain-type armor or lighter, use all missile weapons and one-handed weapons and have the fighting styles weapon and shield as well as two weapons. They also have three Thieving Skills: Hide in Shadow, Move Silently and Backstab. HS and MS require leather or lighter armor to use. Accuracy: Averni Rangers are trained marksmen. That are at a +1 to attack rolls with all missile weapons. Precise Shot: as trained marksmen, Averni Rangers can fire into melee at a -4 to the roll. This stacks with the Proficiency Precise Shooting to reduce the penalty to hit. Sniper: if an Averni Ranger can attack from ambush or is eligible to use backstab, they can do so using a ranged weapon at up to short range. [This is the Proficiency Sniping used as a Custom Power]. Averni Rangers fight and save as Fighters and use the Hideout rules to build a Stronghold at 9th level. My first step in converting some of my ideas about a Homes/Cook Averoigne campaign to ACKS is the idea that the primary purpose of the Thief is that of door opener. As such, I have re-cast the Thief as Burglar and have replaced the Thieves Guild with the Adventurer’s Guild. Mechanically and philosophically, it is important for the feel of the game I want to play that PCs will encounter a semi-intelligent and hostile environment whenever they enter a dungeon. One way to emulate this is that all doors are locked. As such, the primary way of opening doors is to muscle through them. If the attempt fails, however, all chance at surprise is gone. Therefore, PCs have two alternative ways of attempting to open a door without giving up that chance of surprise should that attempt fail. One is magical (Knock) and the other is the Burglar. Enter the ACKS Player Companion. Ostensibly, it is filled with extra classes, races, spells and equipment for use in Autarch’s house campaign world. However, they live by the credo that Every campaign is a law unto itself. Therefore, they provide a section wherein they brake down all of the mechanics that they used to create every class in ACKS (including the core classes) making it possible for Judges (the ACKS version of the DM) and players alike to create custom classes for their own campaigns. Burglars are adventurers who specialize in the opening of doors (thus the title burglar). They may wear chain-type armor or lighter and are able to use axes, bows and crossbows. They can use the fighting styles weapon + shield or two-handed weapons. Burglars have three Thieving skills: Open Locks, Find Traps and Climb Walls. Keen Eyes: Burglars can detect hidden and secret doors with a roll of 8+ on a d20 if they are actively searching and a 14+ on a d20 if only casually inspecting. Loremastery: The burglar can decipher runes, remember ancient history, identify artifacts, etc. with a roll of 18+. This improves by 1 per level of experience. Please Note: I deliberately chose not to give the Burglar the ability to Remove Traps specifically because I do not like having the process of disarming traps reduced to a die roll. I much prefer coming up with the traps and seeing how players figure ways to overcome them. I also chose axes over sword/dagger for allowable weapons because an axe can also be used to open a door. Additionally, in Averoigne swords are something primarily reserved for fighters. This was the first big test for the Custom Class system of ACKS: could it emulate what I was looking for in the Bilbo Baggins inspired thief/burglar archetype? I think it has done so better than my own earlier attempts at making the Thief class something that I would not only allow in my games, but would actually like to play. One who has read this blog over the years may have noticed that I haven’t posted a Lost Colonies Session report in a long time. This is not because the campaign has ended, but rather that the sessions are few and far between and nothing has really happened that I was inspired enough to write about. This is due to the fact that I am not inspired enough by the campaign in its current state to do much more and none of the guys I play with have championed more sessions than the few that we have done. In the meantime, my group has been primarily playing AD&D with a few forays into Pathfinder. At the moment, the guys I play with are enamored by AD&D’s fiddliness — to them it represent more “choice” than other older editions of the game. I could argue that I could accomplish much of the same feel and choices with a much cleaner and simpler ruleset such as S&W or LL + AEC, but I would be missing the point. One has to understand that the group I play with were virtually all introduced to the game with 3rd edition. As such, character builds are very important to them — it is a part of the gaming experience that they really enjoy. I have meditated on this before. I have, in contrast, scratched that itch with various war games which these guys never had as part of their gaming experience. Every couple of months, someone at the table suggests that we play Pathfinder for a while (it being the 3ed emulation of choice). We play awhile until everyone remembers why we don’t like playing 3ed/Pathfinder. I don’t mind terribly much because I have learned to enjoy the game at lower levels and I know we will sooner rather than later go back to an older ruleset or its emulation. What this all means, in the long run, is that I am not ever going to be able to run an Averoigne campaign with the guys I play with the way I want to — with a Holmes/Cook mash-up using either LL or S&W as a jumping off point. While it is incredibly interesting to me and something I would really like to play-test one day, it isn’t something that is going to interest my group. Thus, I am having to re-think about my approach so that I can start play-testing Averoigne and the Chateau des Faussesflammes as concepts. Enter, of all things, Dwimmermount. My faith in that project and my patience have born fruit. One of the things that has come out of all the complications of the project is the generosity of the guys at Autarch. Via a promise made to backers, I have gotten my hands on .pdfs of ACKS and the ACKS Player Companion and done some serious reading and fiddling. I have to say that both are excellent products, if lacking in a few tables & examples here and there which would have made my understanding and use of the products easier. I really like the fact that at its root, ACKS is B/X. I also really appreciate their interpretation of its mechanics extrapolated into the concept of proficiencies/feats, world building and the end-game. In the end, however, I find it too fiddly. I prefer a far more organic/random interaction with world creation than these rules imply and I have never much cared for proficiencies, especially when they really emulate skills and feats that imply more roll playing than role playing. There are aspects that I think will prove very useful in the long run, but won’t really know until I actually use them at the table. This is where I insert the however of this blog post. Even though I don’t care for the fiddliness of ACKS, I do think the guys who I play with will. It scratches the character build itch in a way that AD&D can’t but without all the stuff we don’t like about Pathfinder (I hope). For my own taste, I prefer the fiddliness of ACKS over the fiddliness of AD&D because it represents true player choice and is mechanically cleaner (and did I mention that it is basically B/X — my favorite edition of the game — with a bunch of stuff added on?). Thus, the best chance I have of playing in my version of Averoigne with the guys I play with may very well be ACKS. As such, in the coming days I will be converting some of the work I have done on Averoigne to the ACKS system to see if what emerges is something I am still interested in playing. Today is Holy Saturday according to the Orthodox Calendar. We Orthodox Christians do a funny thing this week. We are so eager to celebrate Pascha (aka Easter) that we turn the clock ahead 12 hours this week. All the morning services happen the night before and all the evening services happen in the morning. Thus, we actually celebrate the Vesperal Liturgy of the Resurrection this morning and will celebrate the morning Divine Liturgy tonight at midnight. Today, Hades groans and cries out, "My authority has been destroyed. I took One who died, as though He were mortal, but I am powerless to contain Him. Along with Him I lose all those, over whom I had ruled. I had held the dead from all ages, but behold, He raises them all." Glory to Your Cross and Your Resurrection, O Lord! I have meditated before on the idea that Christ turns the classic hero story on its head. Normally, the hero descends into the Mythic Underground in order to gain something lost or something that they need in order to defeat whatever nemesis they happen to need to get rid of. As can be seen by this hymn, Christ goes into Hades (aka Sheol aka the Mythic Underground) to conquer it. Thus, the classic trope of the megadungeon that is always restocking itself, morphing and reacting to the PCs as they delve deeper into its bowels also gets turned on its ear. It occurred to me that a previous post might give an interesting answer as to how to reconcile the Christ-as-hero story with the classic D&D megadungeon. Awhile ago, I blogged about something I called The Gnomic Highway, which I equated to the idea of a kind of faerie road that could shorten the distance between two given points, but which would also be far more dangerous than a normal road. Subsequently, I came across the idea of the gnomic will which suggests a deliberate choice away from a path that results in the fulfillment of one’s being. Thus, in a Christian context, it would be possible for PCs to defeat a megadungeon — that once cleared or once a particular goal has been met, that megadungeon ceases to exist in the normal sense; however, one can still find it on the Gnomic Highway — where one can deliberately choose to enter into the Mythic Underground and all its subsequent dangers even though it has ceased to exist as a normal part of the world.